My laundry room is an unorganized mess! Being a short person, I know that if I add cupboards above my washer and dryer I won’t use them to organize because I won’t be able to reach them without pulling out a step stool. Long story short: any organizer hanging over my head is dead to me. Also I don’t want to take down all of the crazy toys decorating my utility room because they sum up the way I feel about doing laundry in the first place – a comedy horror show. Doing laundry does not spark much joy but having clean clothes does! 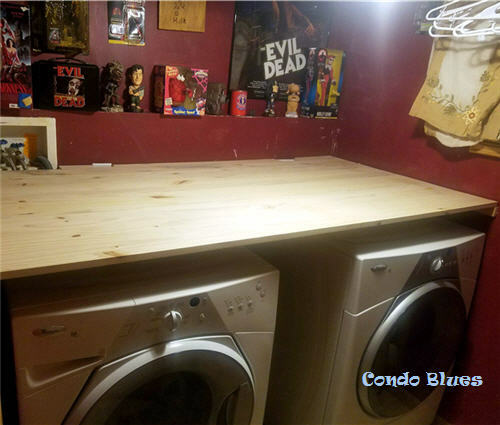 A laundry room counter top and folding station would solve my organization problem nicely – and it is a quick and easy project to make! Pin this post to your Pinterest boards for later! Share it with your friends! Electric drill – I’m a big huge fan of this yellow electric drill swoon! Primer – I only use Kilz no VOC primer (learn about it here) because it covers everything - and I mean everything - including stains, best of it doesn’t reek like regular Kitz! Paint – I am using my favorite brand and color of paint I bought for $2.50 on the mistint shelf. Which is extra fortunate because it is a very close match to the ceiling paint color in my laundry room. Woot. Sander and sandpaper – I recently upgraded to this Bosch orbital sander and wish I had done it sooner! 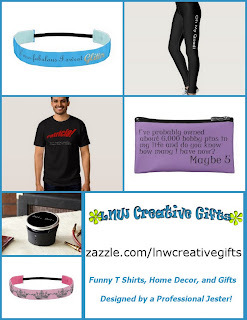 Disclosure: I am including affiliate links to the products I used to make this project for your convenience. 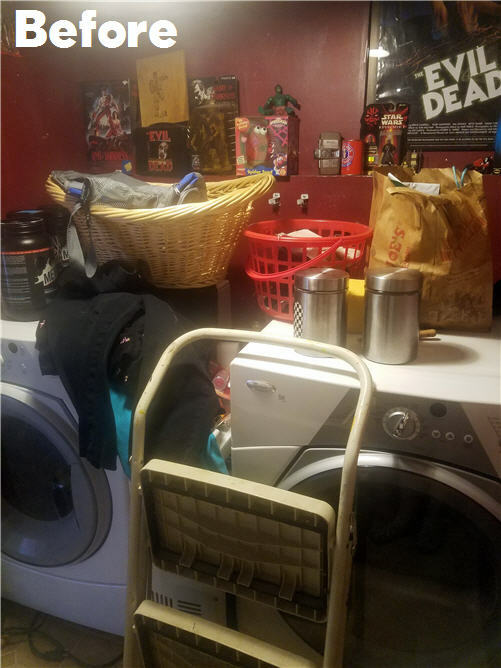 My laundry room is small. 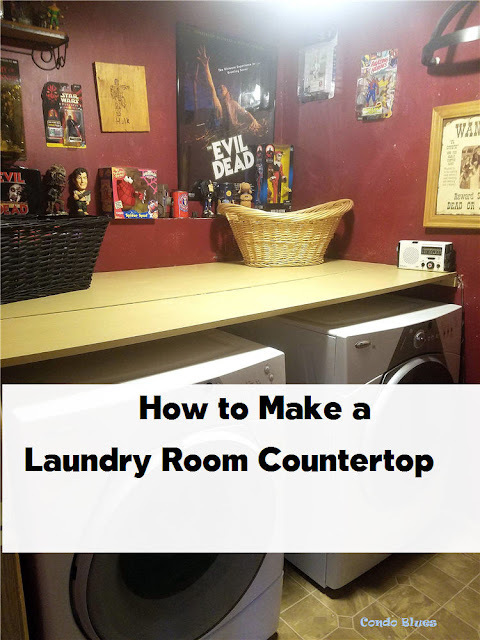 I don’t plan on putting anything heavy on the center of my counter top other than folding laundry which is why I did not add a center support underneath the counter but you can add a center counter support to your washer table top if you like. 1. Measure the length of the room and width of the appliances. 2. Cut three 1 x 12 boards the length to fit wall to wall of your laundry room with the saw. Tip: To save money on lumber, I bought “paint quality” lumber. Paint quality will have more visible knots and such you won’t see after I paint the countertop. 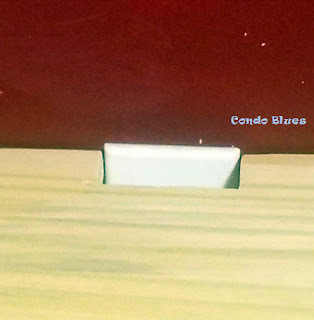 If you plan on staining your countertop, use the slightly more expensive stain quality lumber. 3. Cut the 1 x 2 furring strips to make the cleats you will attach to each side and back walls of the room. 4. Use the sander and sandpaper to sand the top and cut edges of the lumber smooth. 5. Use the electric drill and screws to attach the cut furring strips to the back and side walls to create the wall cleats you will attach the counter top board to in Step 6. You can use wall anchors to attach the cleats to the wall if you cannot drill screws into a wall stud. 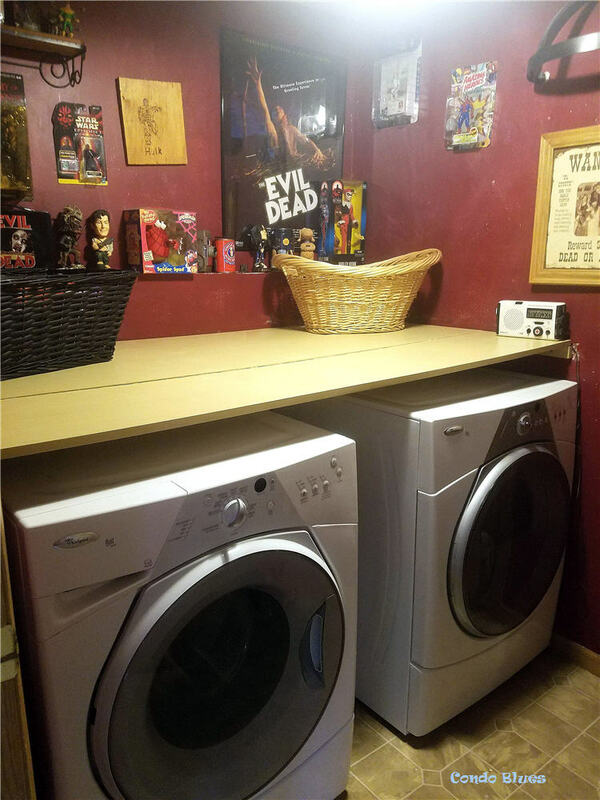 Note: I had to make my laundry counter top higher than I originally wanted because I had to work around the massive washer and dryer electrical plugs. This turned out to be a happy accident because the higher counter top still allows me to use this rolling laundry room organizer cart to hold large containers of DIY HE laundry detergent and right where I need them. 6. Using the countersink drill bit, attach the 1 x 12 boards to the wall cleats to make the counter top. 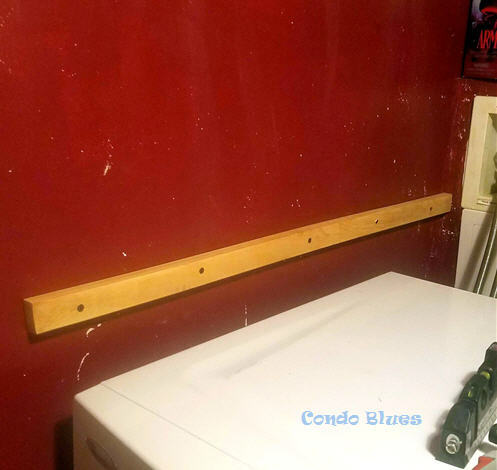 I didn't cover the screws with wood putty because I want to be able to easily remove the counter top if I need to work on the washer or dryer in the future. Note: I made and marked cut outs of the washer and dryer wall outlets and water hookup in the board the butts up against the back wall. If I didn’t I’d have to raise the counter top height even higher which might not be an issue for you but at 4’11” I wanted to built a laundry folding station I could actually reach. 7. Using the paint tray, liner, paint pad, and roller apply a coat of primer to your counter top and let it dry. Tip: If you line the paint try liner with plastic wrap before you pour primer in it, it will make for easy clean up. Just remove and toss the primer covered plastic wrap for a clean paint tray and liner. 8. Using the paint tray, liner, paint pad, and roller apply a coat of paint to the counter top and let it dry. I used two coats of my favorite paint color $2.50 a Pint on the Mistint Shelf. Also, it coordinates with the color on the ceiling which also happened to come from the Mistint Shelf at the home improvement store. 9. I added a storage basket for Lacey’s shampoo and such (you can buy similar baskets here) and a wicker laundry basket (find similar baskets here) to hold the dirty cleaning towels I use instead of paper towels until it is time to pop them in the washing machine. 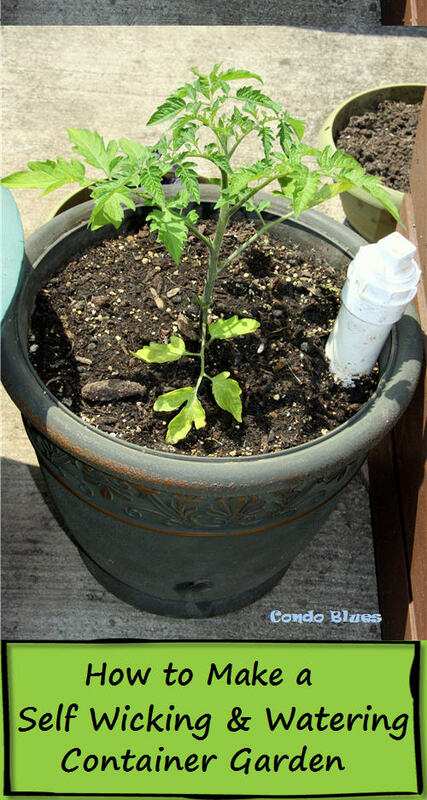 If you'd rather buy than DIY, check out the following ideas - and more! - below! We have been thinking about doing this to our washer and drier too. Pinned for later. Thanks for sharing on To Grandma’s House We Go – I’ll be featuring you next week!